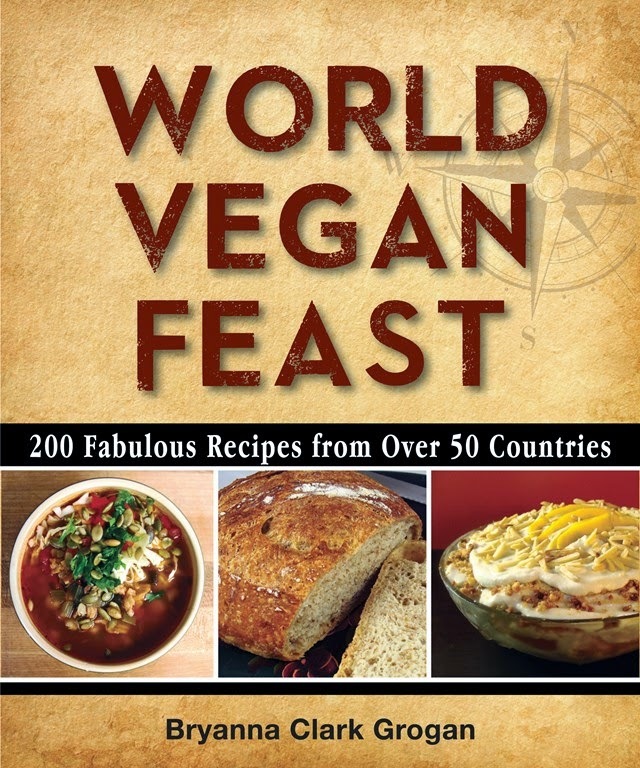 EASTER DINNER WITH A DIFFERENCE FROM "WORLD VEGAN FEAST"
I'd like to share a festive vegan Easter dinner from my book "World Vegan Feast" that is elegant, delicious and just a little bit different. 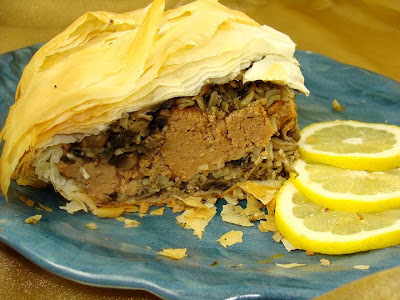 This is my vegan (and lower-fat) version of an elegant dish that dates back to Tzarist Russia, but it was also popular in France and in elegant restaurants in North America at the turn of the 20th century. 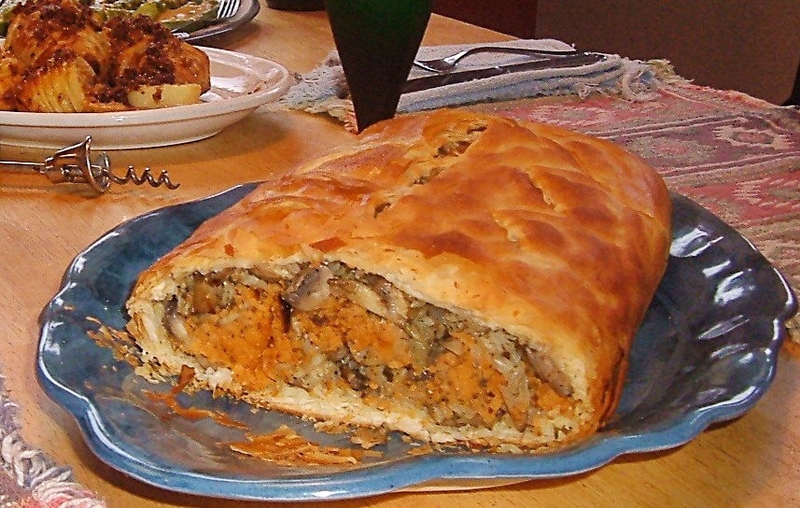 Coulibiac is spectacular and delicious, but easy to make. It makes a wonderful centerpiece for a vegan Easter dinner. The "salmon" is made at least one day ahead of time and then, providing you cook the rice early in the day, it goes together quite quickly. (You can actually make the entire filling the day before, if you wish.) I use phyllo dough instead of puff pastry (to avoid all the hydrogenated fat) and brown basmati rice for extra fiber and nutrition. I broke with tradition a little by serving it with a light vegan cream sauce laced with spring onions instead of the traditional herbed butter sauce. 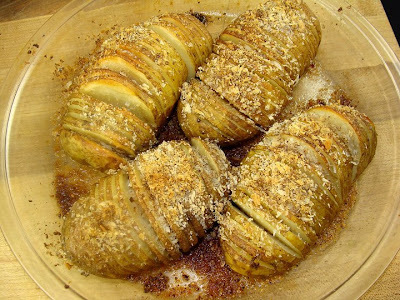 This recipe is adapted from one served at Stockholm's popular old Restaurant Hasselbacken. It's so easy to make and, at the same time, a good way to "fancy" up ordinary potatoes-- crispy and "buttery". The recipe for the vinaigrette is just below (it's not in "World Vegan Feast"), and you can use it on either roasted or steamed asparagus. It can be made several days ahead. 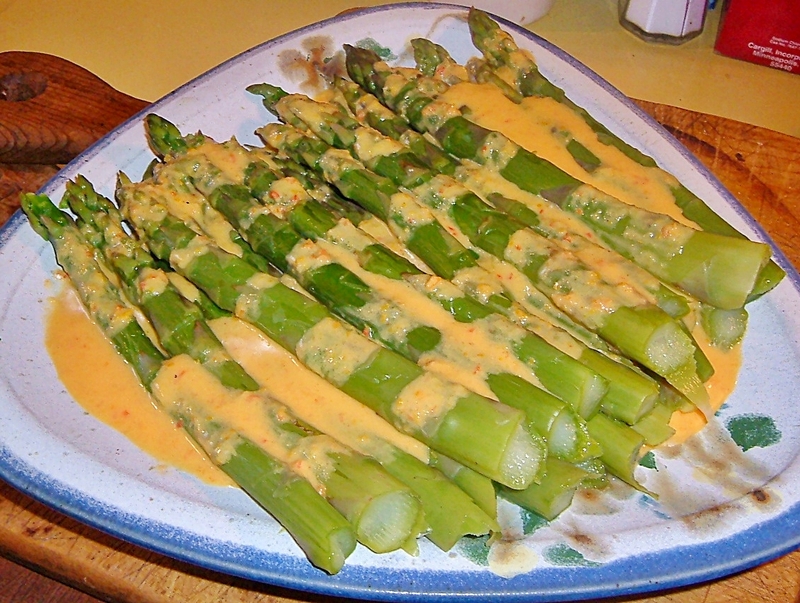 Combine all ingredients in a food processor or blender until smooth refrigerate in a covered jar until ready to serve on a salad, or you can heat this gently to use on roasted or steamed asparagus. 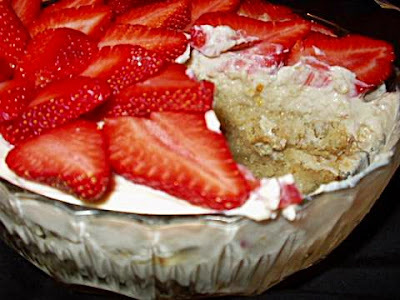 Rich with almonds, fragrant with lemon zest, tangy and sweet, this Tiramísu is alcohol-free, topped with fresh strawberries and contains more cake than the traditional recipe (making it more trifle-like). It is a gorgeous spring or summer dessert! Like traditional Tiramísu and Trifle, this beauty is best assembled and refrigerated the morning of the day you will be serving it. There are various components, but, to ease the burden on the cook, many of them can be easily prepared several days, even weeks, beforehand. This would complement the Russian main course. It's a very decadent, moist three-layer dark chocolate almond cake swathed in fluffy, light chocolate frosting and topped with a generous portion of chocolate curls…mmmmmm! Apparently, it is a common torte to serve with afternoon tea in Russian tearooms and restaurants. I made this for our St. Patrick's Day dinner last Sunday (using my Homemade Vegan Irish Cream liquor ) and it was a big hit! This gelato contains a fair bit of alcohol from the liqueur, so it never gets really hard. Process all of the ingredients in a high-speed blender (not a food processor) for about 2 minutes. Chill the mixture thoroughly (at least 4 hours or overnight). Once chilled, pour into your ice cream maker and freeze according to the manufacturer’s instructions. Scoop into freezer containers, cover and freeze for several hours or overnight before serving. Use any leftover as a cream in coffee or on a dessert. Process everything for 3 minutes (don’t cheat!) in a high-speed blender (not in a food processor). Refrigerate in a covered jar if not using immediately. This will only keep for a couple of days. 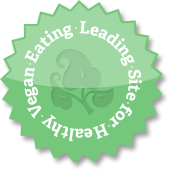 MY VEGAN IRISH STEW AND IRISH APPLE BREAD PUDDING RECIPES-- GOOD ANY DAY OF THE YEAR! This is the vegan Irish stew I prepare every St. Patrick's Day because that's what my husband asks for (and we love it). I posted this photo on my Facebook page a couple of days ago, with a link to an older post which contains the recipe for the accompanying Colcannon (Irish mashed potatoes with kale and/or cabbage). I promised to post the stew recipe, but I didn't get it up on St. Patrick's Day, or the day before, because we had to go off island, and then we had guests yesterday. However, I am going to post it here today even though it's a day late. After all, not only can you enjoy it next St. Patrick's Day, but you can also enjoy it any day of the year (why not?). This stew is entirely my own invention and contains such un-Irish ingredients as soy sauce and red lentils. 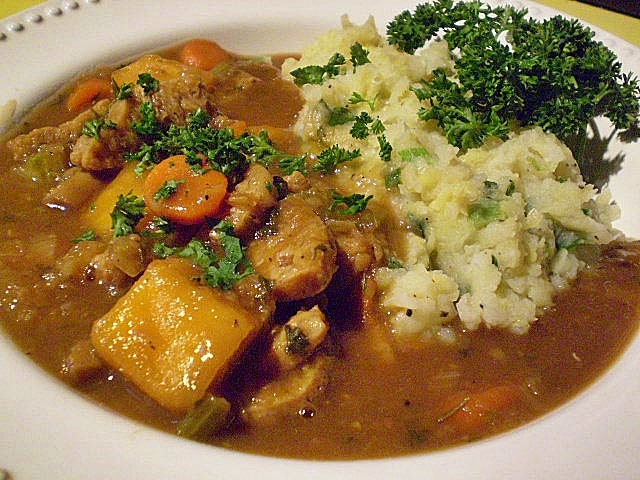 But it has the taste and texture of a good brown stew (or "gypsy", as it's called in some Irish homes), and it's delicious served with Colcannon. Toss the soy protein or seitan chunks, or “Beefless Tips” in the whole wheat flour to coat. In a large heavy pot heat the olive oil over high heat. Add the breaded chunks and brown on all sides. Remove from pot. Add the onion slices and sauté over medium-high until they begin to soften, adding a few drops of water as necessary to keep from sticking. Add the flour and stir around thoroughly. Return the browned chunks to the pot and mix in the remaining ingredients. Bring to a boil. Cover, turn down to low heat and simmer for about 30 minutes or until the vegetables are done. Taste for seasoning. Serve with mashed potatoes, boiled or steamed potatoes, or Colcannon (mashed potatoes with kale and/or cabbage-- recipe here). 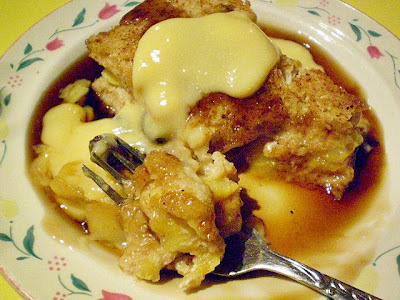 In researching the cooking of Ireland, I've noticed that apple desserts take pride of place. This is our favorite. Poach the apples in the apple juice in a covered skillet for 10 minutes. In a lightly-greased 9" square pan, place 4 slices of bread, cut to fit the bottom of the pan. With a slotted spoon, place the poached apples over the bread and sprinkle with the currants or raisins . Top with the remaining bread slices. In a medium bowl, whisk together the soymilk, sugar, nutritional yeast, cinnamon, vanilla and salt. Pour over the bread and apples. Let sit for 20 minutes while you preheat the oven to 375degrees F (soaking the bread before baking is important). Sprinkle the top of the pudding with cinnamon. Place the pan inside of a larger one with hot water in the bottom. Bake for 30 minutes. Make Brown Sugar Sauce while the pudding bakes: In a small saucepan, mix together all of the ingredients except the vanilla or whiskey. Bring to a boil, stirring. Simmer 5 minutes. Stir in the vanilla or whiskey. (If you want the whiskey flavor without the alcohol, add the whiskey at the beginning of the cooking time, so that the alcohol boils off.) Serve warm. When the pudding is baked, cool for at least half an hour, cut into 6 squares and serve with the warm Brown Sugar/Whiskey Sauce and Custard Sauce poured over it. My latest obsession is baking and making creamy salad dressings with beans. Dreena Burton unknowingly instigated all this, I'm afraid. I made her wonderful Hummus Salad Dressing and that got me thinking about using pureed white beans to make creamy vegan salad dressings. A delicious bean-based Caesar Salad Dressing resulted (recipe below) and I'm working on a few more. 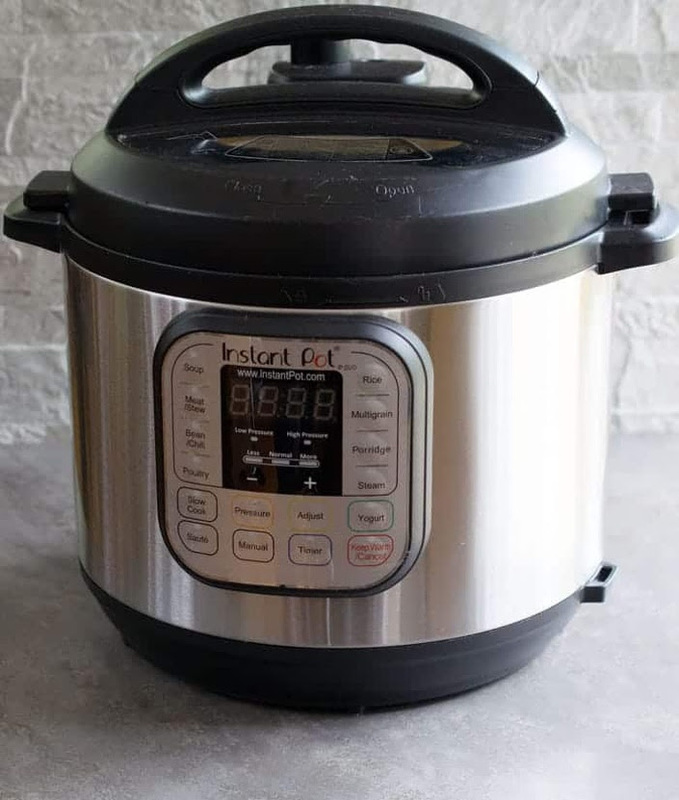 That led me to some information (mostly from folks who are into food storage) on using puree beans instead of fat in baking (sometimes for all of the fat, sometimes for some of it). I have held back from intensive experimenting with this because, for reasons of vanity, I don't want to eat too many baked goods, fat-free or not! But I have lots of ideas. In the meantime, I tried two cookie recipes. I was not entirely satisfied with the chocolate chip cookies I experimented with (2 versions), so I have put them on the back burner for now, along with using bean puree in muffins. But I was happy with the oatmeal raisin cookies I tested (and so was DH! 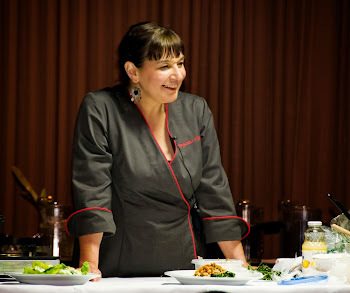 ), so I'm including the recipe in this post. Next I tried using a white bean puree in a no-knead pizza dough. This idea has intrigued me for some time and I'm so glad it worked so well (and in a no-knead dough at that!). It's a great way to add healthy protein and bean fiber to a kid-friendly meal. I looked up the nutrition facts for a Boboli thin-crust for pizza of the same size as mine. 1/2 a Boboli thin crust contains: 70 more calories than mine; 7.5 g fat compared to the 1.2 g in mine; 330 mg more sodium than my crust; about the same amount of protein; and a little over 1 g of fiber compared to 7 g in mine. Not bad! I use plenty of beans in my day-to-day cooking, but I think using them in more unusual ways would be helpful for many people. It might be easier to get kids (and older folks with waning appetites) to eat beans in a salad, creamy soup, dip, pizza, muffin or cookie, for instance. Everyone could reap the benefits of beans, even while claiming to dislike them. What are these bean benefits? They are easy to store, easy on the purse, and versatile in the kitchen. They are filling and low in fat, and according to this study: "Adding beans and other legumes to the diet appears to help people with type 2 diabetes improve their blood sugar control and lower their risk of heart disease, according to new research. Two diets were tested in 121 men and women with type 2 diabetes. Both diets were healthy, but one added legumes, such as chickpeas, lentils, and beans. "People with diabetes did better in terms of blood sugar control on the bean diet versus a diet without beans, which was otherwise extremely healthy," says researcher David J.A. Jenkins, MD, PhD, DSc, professor of medicine and nutrition at the University of Toronto and St. Michael's Hospital in Toronto. The bean diet lowered the predicted risk of heart disease more, too, Jenkins says. And it did so in a way that surprised him, he says. "It reduced heart disease risk predominantly because of its effect on blood pressure," he says. The following three recipes feature white beans, but, depending on the color you are aiming for in your recipes, any other beans can be used. TIP: You can buy cans of beans, of course, but what I've been doing is cooking big batches of beans and freezing them in 1, 2 or 3 cup containers or zipper-lock bags. If you use canned beans and you have some left over, freeze the excess and add the leftovers together to make enough for another recipe. WHAT KIND OF WHITE BEANS? Check out this article. BEAN PUREE: If you want 1 cup iof bean puree, measure out 1 cup of rinsed and drained cooked or canned beans, packing them down a bit. Puree with a hand/immersion blender, or in a blender or food processor. If the mixture is too thick to move on the blades, add a little water (carefully) until it does. Multiply as needed. These cookies were made with rolled oats, but I think quick oats make a better cookie-- however those pics didn't come out as well as these ones. 2.) Add some chopped organic candied ginger. 3.) Add some chopped nuts or seeds— this will add more fat and calories to the recipe. 4.) Use organic fair trade chocolate chips instead of raisins-- this will add more fat and calories to the recipe. 5.) Use or add other spices, such as cinnamon. Preheat the oven to 350ºF. Line 2 large baking sheets with baking parchment. Combine the Wet Mix ingredients until smooth with a hand/immersion blender, or a hand-held electric beater in a medium bowl; or blend them in a food processor or blender and pour into a medium bowl. In a smaller bowl, combine the Dry Mix ingredients well. Dumb the dry Mix into the Wet Mix and mix briefly. Add the oats and raisins (or any variations) and stir well. Using a 2 tablespoon cookie dough scoop, place mounds of the dough onto the parchment-lined baking sheets, leaving at least 1-inch space between the mounds. Place each baking sheet on a rack (not too close to the bottom or top of the oven) and bake for 11 minutes. Switch the sheets from one rack to another and back-to-front. Bake about 22 minutes, or until the cookies are just a light golden color. If they get darker, they will be too dry. Transfer the cookies (still on the parchment) to racks and cool for about 30 minutes before serving. If you don’t eat the cookies in 2 days, it’s best to freeze them, as fat-free cookies don’t last as long as those with fat added. 136.8 calories; 5% calories from fat; 0.9g total fat; 0.0mg cholesterol; 37.7mg sodium; 166.0mg potassium; 31.2g carbohydrates; 2.2g fiber; 18.4g sugar; 29.0g net carbs; 3.0g protein; 2.4 points. The easiest pizza dough ever, and with the added protein and fiber of beans (but no one will know). You can make the dough a week ahead, or a day ahead, or the morning of the night you will serve the pizza. Either way, there is very little effort on your part, except for the actual rolling out and baking. The slow rising develops the gluten just as kneading would, and develops flavor as well. In a medium bowl, mix the water and yeast. Let sit for 5 minutes. Add the bean puree and salt and mix well, using a wooden spoon or Danish dough whisk. Stir in the flours just until mixed (it will look messy—no worries!). Cover and let rise at room temperature for an hour. Then, stored properly (see below) place in the refrigerator until you are ready to use the dough to make pizza. Storing the dough in the refrigerator: If you have a dough bucket with a lid, or a bowl with a lid, then use that. There should be room for the dough to triple. Otherwise, cover the bowl with plastic wrap, or an unused disposable shower cap (you can buy these cheaply at $$ stores), or place the bowl inside of a large food-safe plastic bag and secure. You can make the dough a week ahead, or a day ahead, or the morning of the night you will serve the pizza. If you make it the morning of the day you will make the pizza, make it early in the morning, so that it has at least 10 hours in the refrigerator. There is no need to bring the dough to room temperature before baking. Divide it in 2 pieces and roll out as usual (see this post for ideas for shaping and baking pizza); top as desired, and bake at 500 to 550ºF for about 8 minutes. Use a pizza stone, if you have one, (heated for about 45 minutes in the oven), or a cast iron skillet (see about making pizza in cast iron at this post)or heavy baking sheets or pizza pans (these can also be heated in the oven for about 30 minutes before placing the pizza on the pans for baking—this makes a great crust). You can transfer the pizza to the hot pan or stone using baking parchment— just pull the pizza off of an upside-down pizza pan or baking sheet, or a baking sheet without sides. The parchment goes into the pan along with the pizza. Nutrition (per 1/2 a 12-inch crust, topping NOT included): 349.4 calories; 2% calories from fat; 1.2g total fat; 0.0mg cholesterol; 477.4mg sodium; 438.7mg potassium; 71.0g carbohydrates; 7.0g fiber; 0.4g sugar; 64.0g net carbs; 14.0g protein; 6.3 points. I had to photograph the Caesar Dressing on a regular salad because I didn't have any Romaine lettuce at the time-- but it was still delicious. Blend all of the ingredients in a blender until smooth. Store the dressing in a covered jar or bottle in the refrigerator.